The Micromax Canvas Mega E353 is the newest entrant in the market from the Indian smartphone maker. The device is targeted towards online shoppers and is exclusively available on Flipkart. The new canvas houses a mega 5.5-inch 720P IPS with 267 PPI (pixel-per-inch). The company has relied on Corning Gorilla Glass 3 coating for protection against scratches. This moderately thick (8.9mm) phone is packed with a 1.4GHz octa-core processor and 1GB of RAM to handle all the work load. Phone comes with 8GB of onboard storage which is further expandable. Plugging-in a 32GB microSD card, will give you ample secondary storage space to load media files. Micromax has been focusing more on improving camera performance over the years. Company has roped in a 13MP primary snapper with full HD video recording capability. To impress selfie lover, the Indian tech company has placed a 5MP shooter at the front. The Canvas Mega E353 dual SIM phone features a list of connectivity options 3G, Wi-Fi, GPS/A-GPS, Bluetooth v4.0, USB port and microUSB. Phone draw all the power from 2820 mAh battery which can easily offer more than 24 hour standby time. 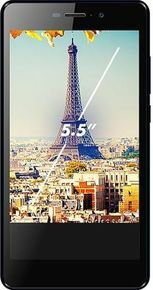 Micromax Canvas Mega E353 price in India is Rs. 8,349.